The MA-1 was designed by the United States Air Force. They needed a more comfortable and less bulky pilot jacket than the leather jacket they were wearing at the time. The MA-1 Flight Jacket was first issued about 1949 to the Air Force , Navy pilots and their flight crews. The jacket was made to be reversible with an orange lining so that down pilots could be seen. There are 2 inside hand pockets that were made to be used when you reverse the jacket and serves pilots as inside gear pockets to keep items safe. On the arm is the signature flight jacket pencil/pen holder along with a small zipper pocket for a map or notes. We find this very useful and give the flight jacket its notable look. Protect yourself and keep warm in this Concealed Carry MA-1 Flight Jacket. A cool combination, we have added the classic military bomber style and padded concealment pockets (on both the left and right side of jacket) and four mag pouches.The concealed carry pockets with ambidextrous layout are padded with hook and loop closures to ensure comfort and proper concealment; the pockets measure 7.75" X 10.5" and can easily fit a handgun. In addition to the concealed carry pockets and mag pouches, the MA-1 Jacket has two inside slash pockets with snap closure, two front slash pockets with flap and snap closure and a zippered utility pocket located on the left sleeve. In line with the classic military-style, the jacket features 100% nylon water repellent outer shell, reversible orange lining, and poly fiberfill for warmth. Brass zippers and an extra full cut design complete the jacket. This jacket was designed to conceal not only your firearms but can securely carry expensive tech devices, important documents and more. 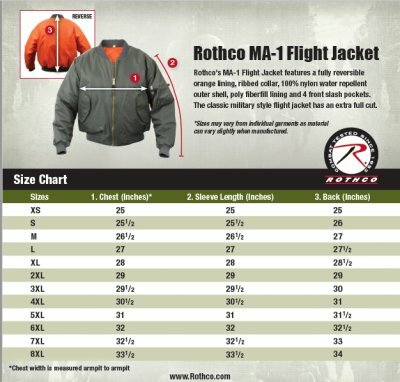 Rothco is a manufacturer of military, tactical, outdoor clothing and gear founded in 1953 to the military industry. The company has grown to be a well-known and trusted brand for everyday use. Click the button below to add the Concealed Carry Black MA-1 Flight Jacket to your wish list.